City dogs out on the town—that’s who you’ll find in Dogs, Dogs, Dogs! Dogs swimming laps, dogs taking naps, dogs doing tricks, dogs chasing sticks. Count the dogs from page to page as they race through the streets past ladies wearing hats and a building full of cats on their way to adventures galore! My dog Angus was a Cairn terrier, just like Toto in The Wizard of Oz. I have always loved dogs and when I was twelve years old, my parents surprised me with my own dog, a Cairn terrier named Angus. I was inspired to write Dogs, Dogs, Dogs! one day when I was in New York City and saw a dogwalker walking ten dogs at once! A counting book, written in rhyme, that tells the story of ten city dogs out on the town. Four dogs climbing up and down a row of stoops…. 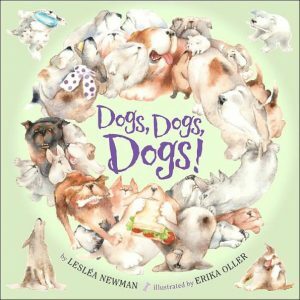 You are here: LesleaKids.com > Books for Kids & Teens > Picture Books > Dogs, Dogs, Dogs!